Home » Website Building » SEO » What is Submit URL Option in Bing Webmaster Tools? It is a common practice that webmasters update their site with new content or change the URL of an existing page for various reasons. Search engines take quite a long time to crawl your new content or replace the existing URL in the index with your new URL. Hence, webmasters need to loose the traffic and wait till the time the new content or new URL is indexed in the search engine’s database. Bing offers a simple solution to help webmasters avoid waiting for the Bingbot to crawl and inform Bingbot instantly to index the new and changed URLs. How to Submit New and Changed URLs to Bing? Login to your Bing webmaster tools account and select the site you want to add URLs. You must have added and verified your site in your account to use this feature. “Submit URL” option is available under “Configure My Site” tab. Enter the URLs one per line and click on “Submit” button. Once submitted the URLs will be listed in the same page for your reference. The submitted URLs are crawled immediately to check the quality of the content. If quality criteria are met then the pages will be indexed and start showing in the search results. You can resubmit the same URLs anytime later by selecting and clicking on the “Resubmit” button. 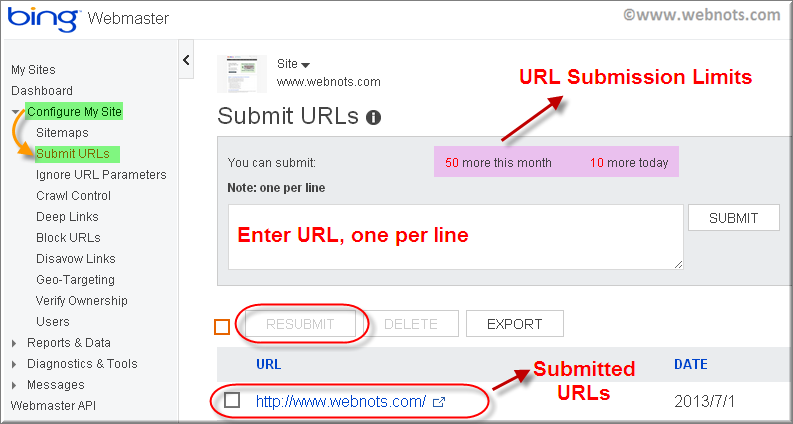 Submit URL feature is available only for the top level or root domain sites. For example: www.webnots.com will have this feature but blog.webnots.com will not have this feature. This means free sites created as a subdomain (example: yoursite.weebly.com) will not have this feature enabled in Bing webmaster tools. For a root level domain also the number of submission is limited for submitting your URLs. You can submit maximum 50 URLs per month at the rate of maximum 10 per day. These limits are applicable at domain level means each domain in your account will have these limits set per domain.